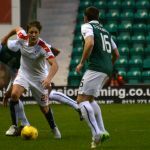 Raith Rovers were Hibernian’s first-footers at Easter Road this afternoon, but the Leith side proved to be too strong for their guests, as a Jason Cummings goal was enough to see Alan Stubbs team take all three points. Rovers boss, Ray McKinnon was forced into three changes from the side which won last time out at Cappielow, with Lewis Toshney, Iain Davidson and Mark Stewart all missing out through injury. In their place came the trio of Ross Matthews, Mitch Megginson and David Bates. As you would expect, this meant a re-jig to the formation and system which has been most commonly used in recent weeks. 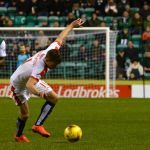 Jon Daly was asked to plough a lone-furrow up-top, while David Bates deputised for the absent Toshney at centre-half. Scott Robertson started in the right-back slot, with Mitch Megginson in front of him on the right-hand-side of midfield. 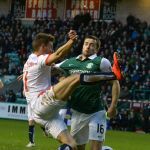 Hibs were obviously looking to put the disappointment of their recent defeat to Rangers behind them, and they attempted to take the game by the scruff of the neck straight from kick-off. A well worked move saw Kyle Benedictus having to be alert in the game’s opening seconds, with a fine covering block putting a stop to a dangerous looking Hibernian move. Despite Rovers squad being decimated by injury, they were settling into the game well. Fine play down the right-hand side saw a cross swung over to Rory McKeown at the back post, and while his header down was well weighted, it just missed the three Raith players who were in support, and the chance was eventually cleared. Rovers continued to impress, and a great pass from Ryan McCord released Ross Callachan down the right, and although his low cross found James Craigen in the six-yard-box, his half-volley was blocked by Paul Hanlon almost as soon as it left his boot. Raith were getting closer and closer at this stage, and another accurate cross, this time from James Craigen was flicked goalward by Daly, but was desperately hacked away as it dribbled towards the far post. It took the home side a quarter-of-an-hour to register a meaningful attempt at goal, when a twenty-five yard effort from Marvin Bartley was comfortably handled by custodian, Kevin Cuthbert. They did come close a moment later however, when a Lewis Stevenson cross ended up sailing over everyone’s heads and rebounding off the crossbar. 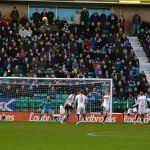 While Raith had started the match with an impressive vim and zip about them, the longer the half wore on, the more the Hibs midfield was starting to get their foot on the ball and make an impression on proceedings. 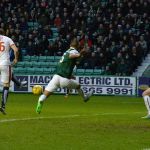 Dominique Malonga and Cummings were yet to be presented with an opportunity of note, but the feeling was that Hibs were now the side with their tails up as the half wore on. That changed on the half-hour mark, when an interchange between Hanlon and Cummings teed up Malonga on the edge of the box, but his effort was launched into a reasonably high row in the Famous Five Stand behind the goal. 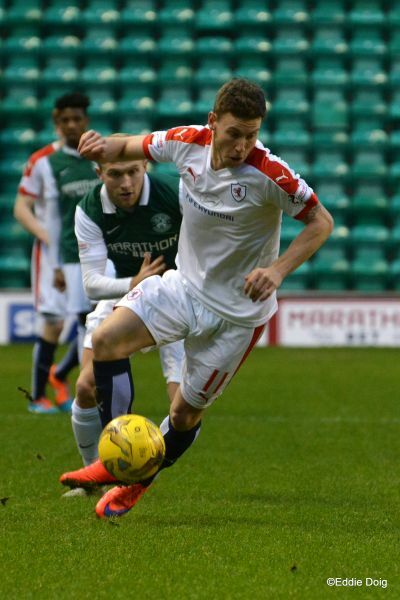 While Raith’s midfield had been creative in the early stages, they were now being asked to predominantly defend, but they were doing so successfully, with Matthews and Callachan in particular, going about their work in a diligent manner. With ten minutes of the half remaining, Cummings troubled Cuthbert, picking up possession on the right-hand-side of the penalty area, before cutting inside and pinging a shot just over. 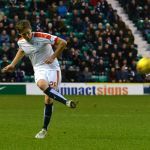 As the interval approached, Hibs passed up the best chance of the game, when a lofted ball into the six-yard-area was somehow headed over the bar from point-blank range by Gray. With Hibs now very much in the ascendency, the shrill peep of George Salmond’s whistle to indicate half-time was a welcome sound to Raith ears. 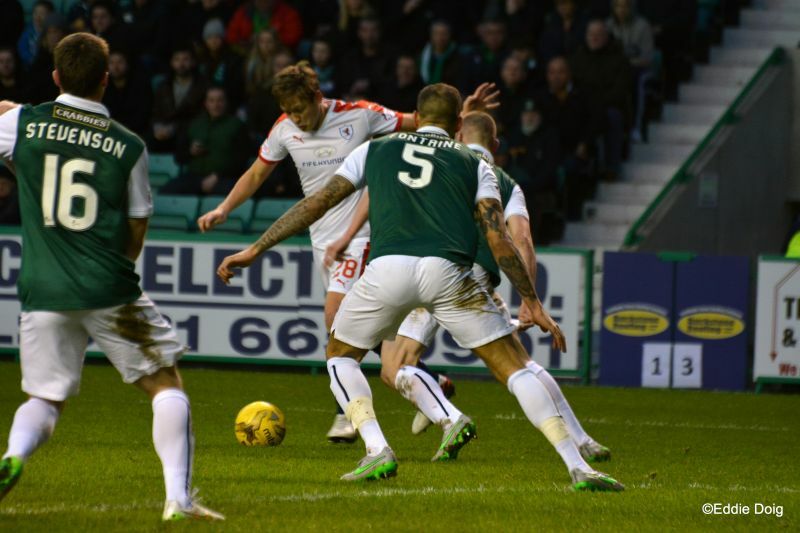 The second-period started in a similar vein as the first ended, with Hibs on the front foot. Bartley won possession in midfield with a strong challenge, before setting up Cummings whose shot was well held by Cuthbert. 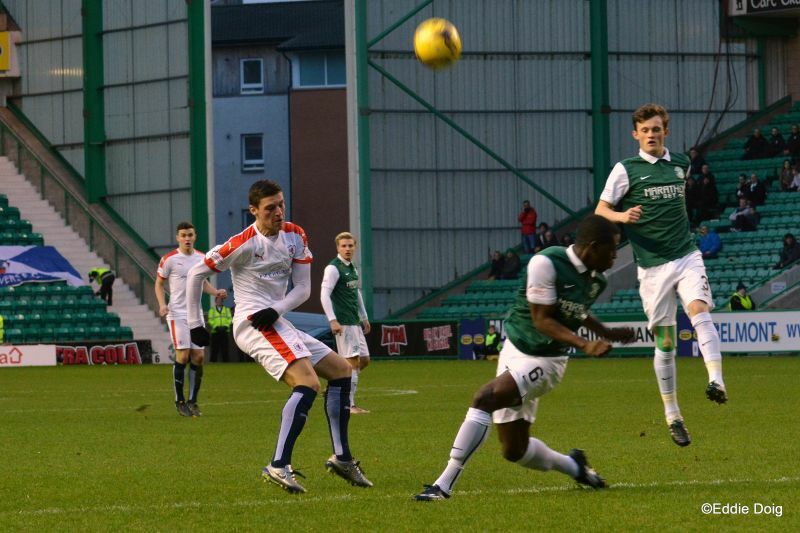 The respite was short-lived however, as Hibs took the lead seconds later. Cummings was sent through inside the area, and as he attempted to drag the ball around Kyle Benedictus, the defender brought caught him with his outstretched leg. Cummings took the kick himself, and although Cuthbert excellently stopped his effort, he couldn’t quite stop his rebound from trickling over the line. 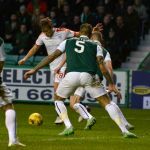 Hibs weren’t content to just sit back and admire their handiwork however, as they continued to bomb forward, as Cummings almost made it two in a matter of moments, as his lofted effort over Cuthbert drifted just wide. 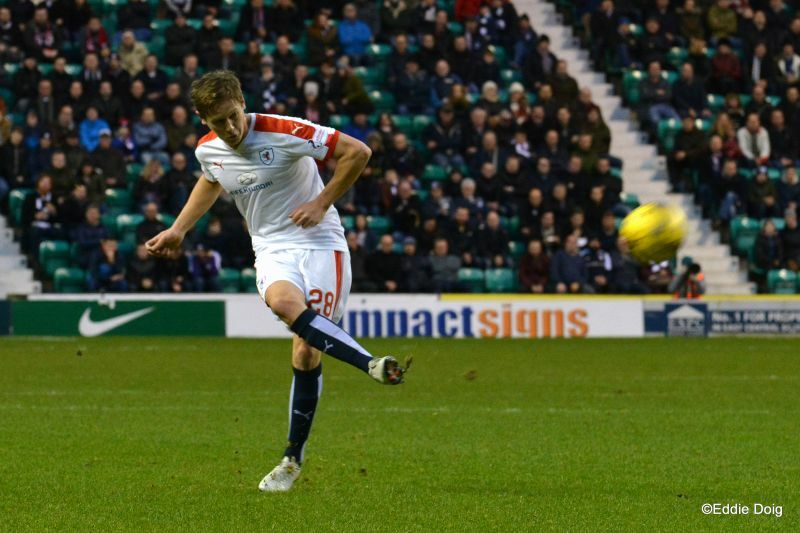 The goal seemed to prompt a change, with Megginson going more central as Raith chased an equaliser. 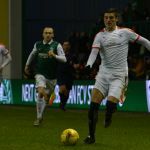 They almost had one too in the 53rd minute, when a Daly flick on played in Callachan, but he was closed down before he got the chance to drive in a shot from inside the six-yard area. 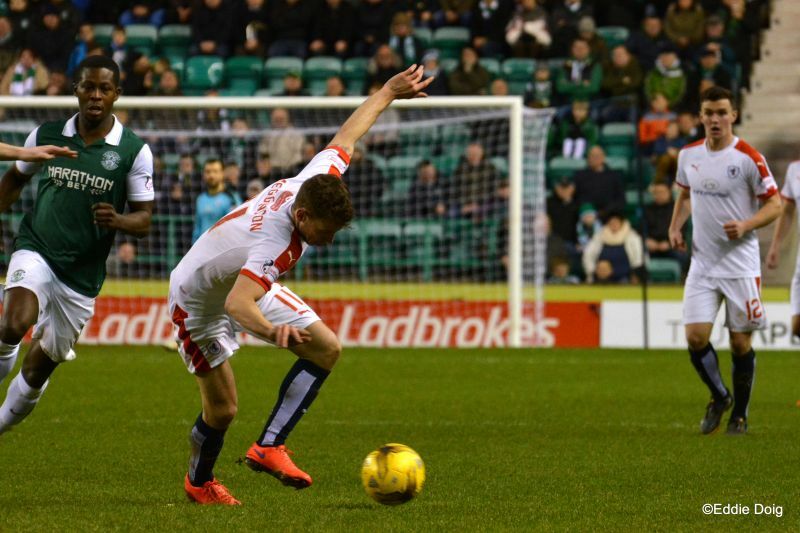 Five minutes later, Ray McKinnon made his first change, replacing McCord with Craig Wighton. Despite the attacking intent, Rovers were struggling to create anything of note, to be fair, neither were the home side, although Liam Fontaine put a header just over the bar from inside the area. The slender lead was starting to make the home support twitchy, and with 20 minutes remaining, a sense of unease seemed to be sweeping over Easter Road. That’s not to say Rovers were showing any evidence of getting back into the match, but with the game getting bogged down in midfield, the match had very much become a frustrating, attritional spectacle. Rovers then made their second change, with Grant Anderson being introduced to the fray, as Megginson made way. 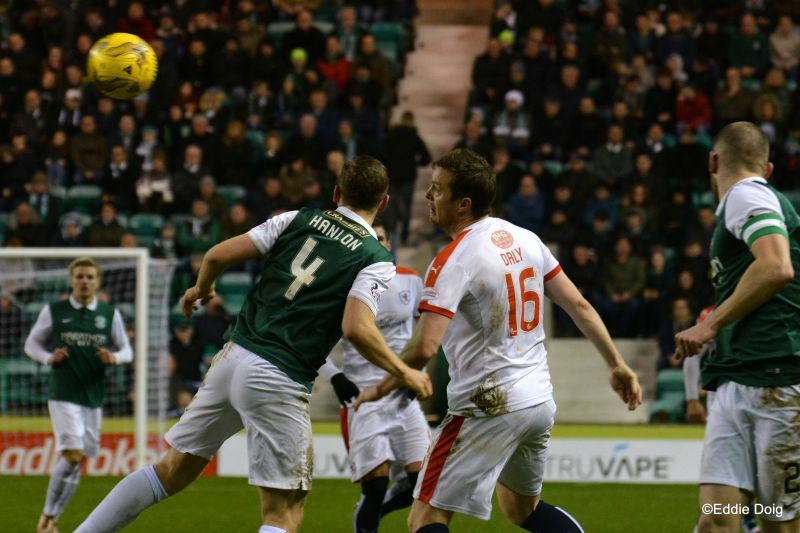 While Hibs were bossing possession, the pressure on the Raith goal wasn’t quite incessant, although that was mostly down to the hard work of the Rovers backline, which was doing a fine job of getting a head or boot on the end of the home side’s numerous crosses into the penalty box. Despite the slenderest of leads, there was no grandstand finish to the match, with Rovers creating little as the clock wore down. Indeed, their quest to find a leveller was made even harder, when Grant Anderson, who had been booked not long after coming on, was given his second-yellow card in the last-minute after a late challenge on Paul Hanlon. Despite the defeat, Rovers remain in fourth place in the table, and will face up to the same opponents next Saturday at Stark’s Park, in the Scottish Cup. Welcome to Easter Road, it's a mild 10 degrees and no sign of the promised rain. A happy new year to Rovers fans around the globe and appropriate to our hosts, lang may your lum reek. 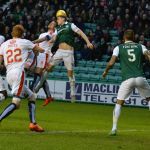 Our last 7 games are in favour of Hibs with 3 wins, 2 draws and 2 defeats. In November a player familiar to both sides was inducted into the hall of fame, the late great Joe Baker. We extend a special seasons greetings to Ally Gourlay who cannot attend today, keep your chin up friend. Hibs kick off towards the South Stand. 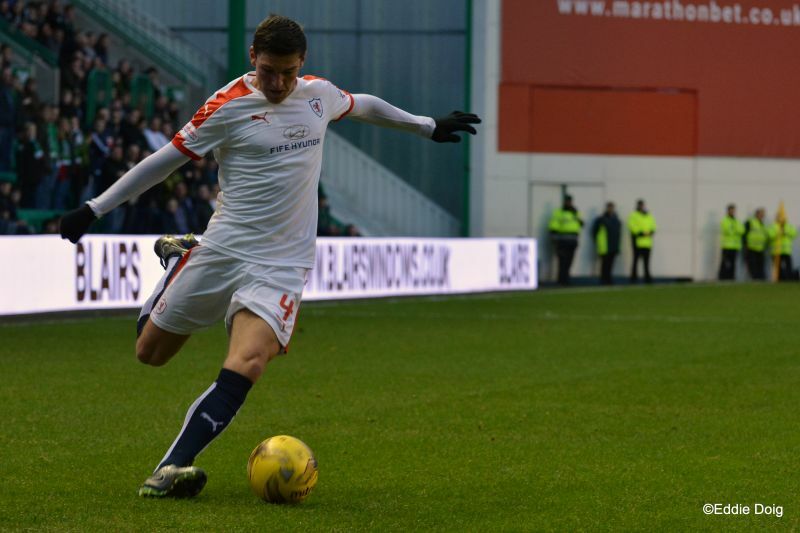 Jon Daly gets the second half underway. Bates playing along side Benedictus at CB. 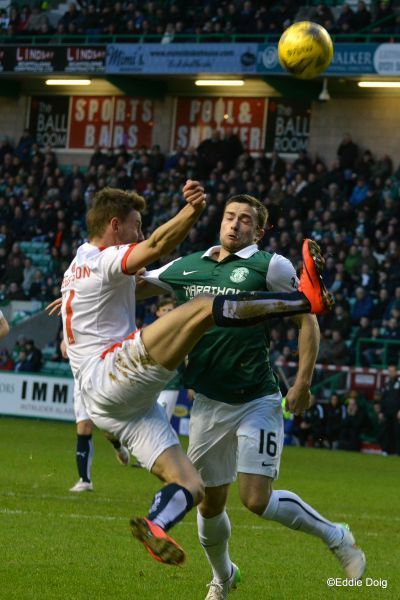 Raith pressing in the Hibs box, Callachan the last to play the ball in sees his shot blocked. Both teams content to stroke the ball about midfield at the moment. 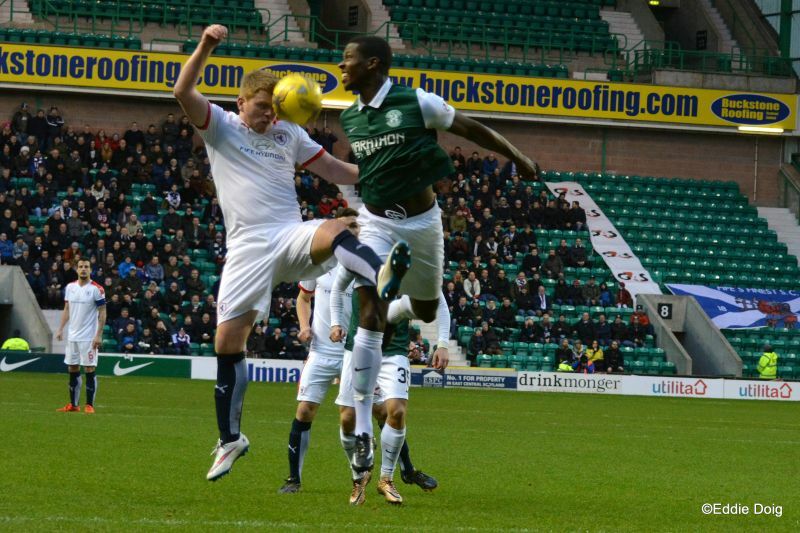 Malonga through in the area runs out of pitch. McCord finding Callachan clear on the right, he whips the ball into Craigen but is denied by diving defender. Cummings slips his marker, Cuthbert runs out to clear. 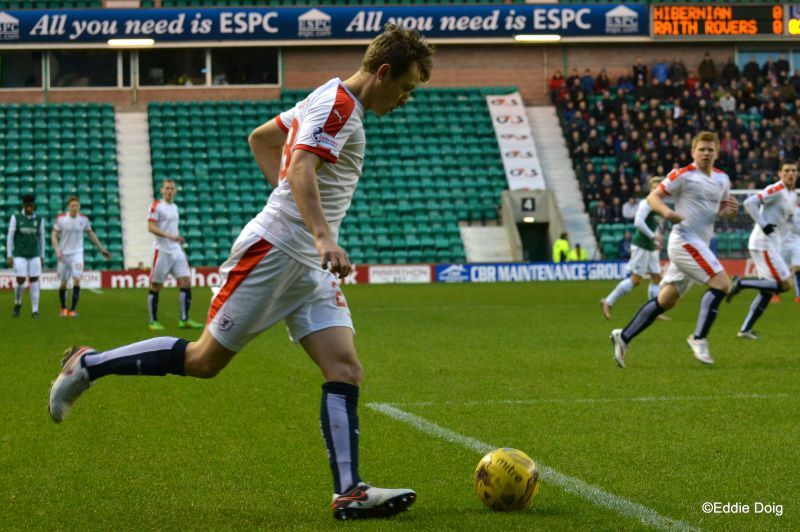 McCord at the back post watched as McGeouch toes the ball wide for a corner. Fontaine bulldozes McCord to the deck, Mr Salmond waves on play. Cummings with a tame shot, straight into the arms of Cuthbert. Stevenson shoots from the left, the ball grazes the top of the bar. 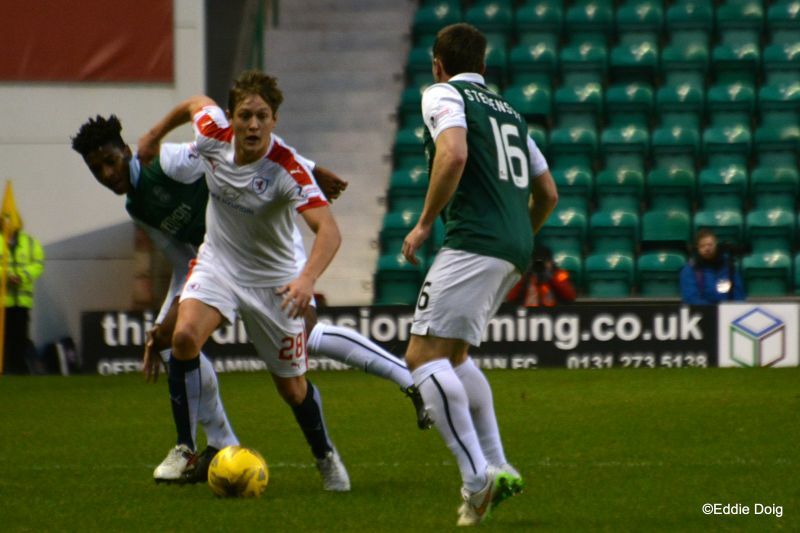 Hibs are shy of their usual pace this afternoon. Craigen fires a free kick to the top left corner, Oxley injured himself as he came down on top of a defender. Tackles going on all over the place, none deemed serious by the official. Gray yellow for fouling McKeowan whilst out of play. Stevenson afforded too much space on the left, whips in a cross which runs out of play. Matthews losing his marker sets up a phase of play to allow Rovers to confidently pass the ball about. 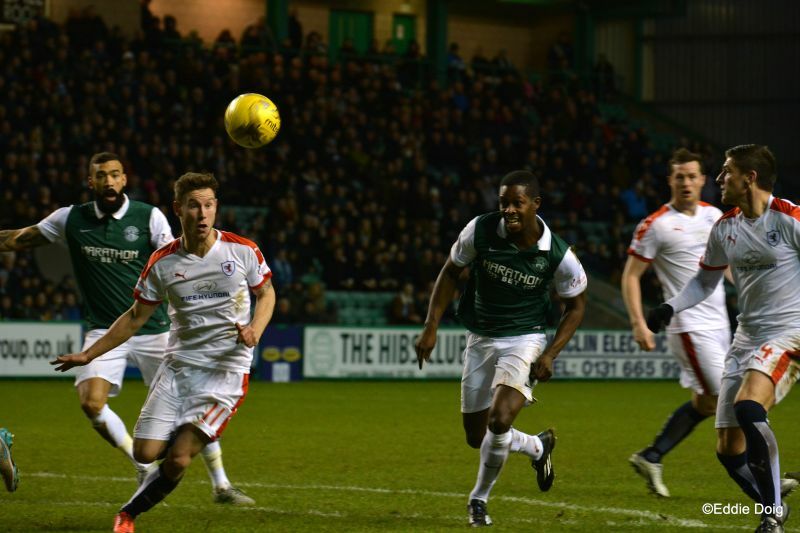 Malonga twists and turns to shoot but due to the attention of Benedictus his shot goes wildly over the bar. 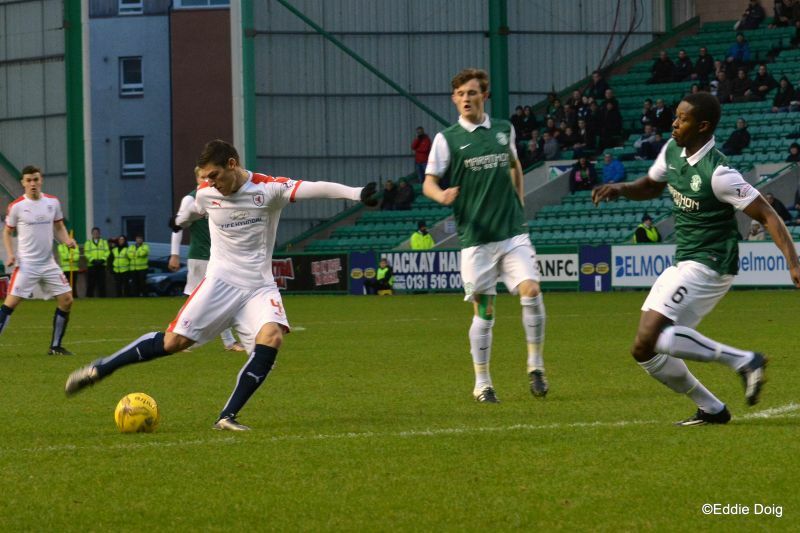 Ross Matthews calmly taking care of business, disposing McGeouch. Cummings beats two markers and shoots from the corner of the 18 yard box, his effort sailing over the bar. 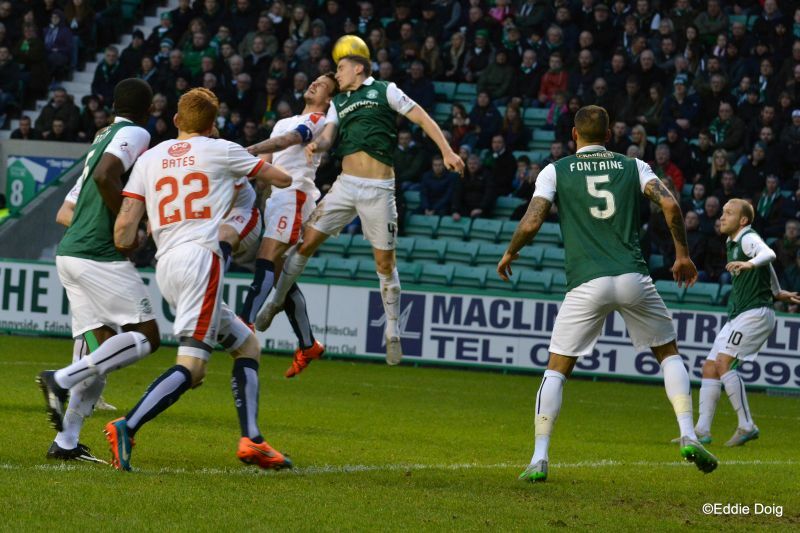 McGeouch flights in a perfect cross but Malonga is half a yard away from getting contact on the ball. Gray just getting over McKeowan heads the ball over the bar. 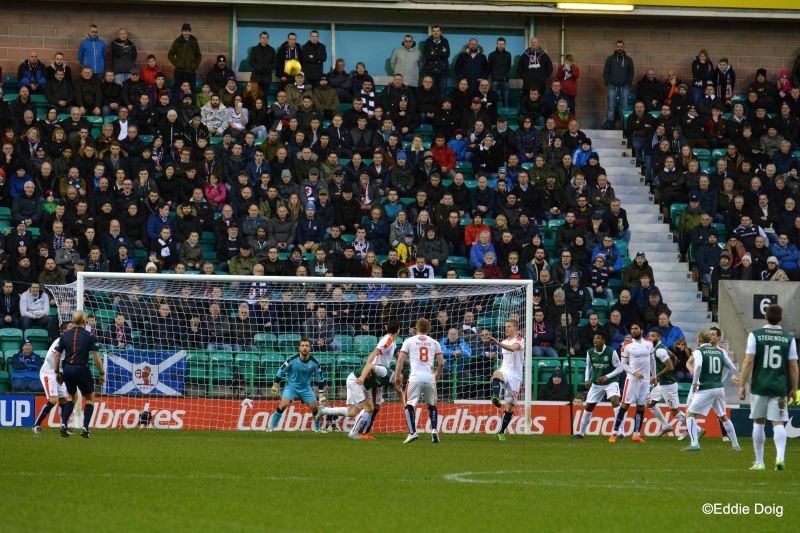 McGinn testing Cuthbert from 18 yards. Benedictus downs Cummings in the box, penalty. Cummings takes the penalty, Cuthbert saves then parries his second attempt but Cummings scores at the third time of asking. 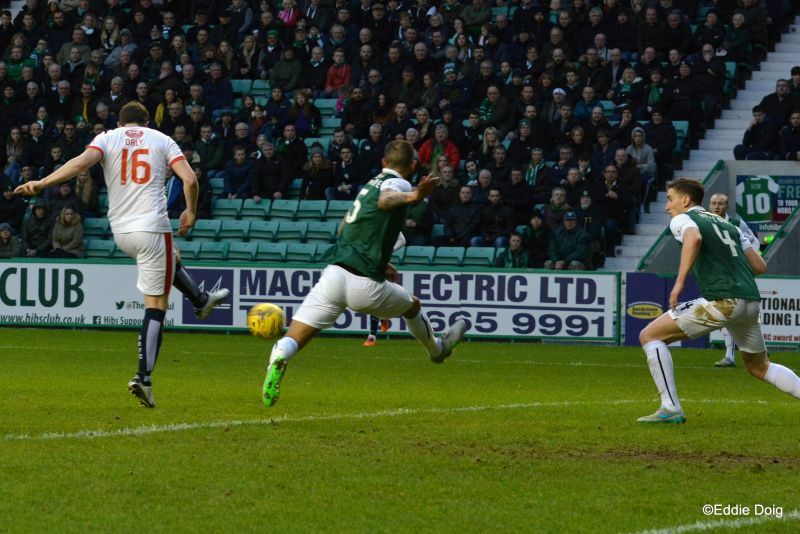 Goal Hibs. Cummings free on the left chips Bates but the ball rolls out at the back post. Callachan yellow for a tussle with Malonga. Callachan plays a one two with McCord, his final ball is tame and Oxley clears. Rovers defence guilty of ball watching let McGeouch in on the right his shot parried out of play by Cuthbert. Bartley and Megginson yellow, the former clearly guilty of kicking out at Megginson. Fontaine heads just over from the edge of the area. Gray heads well wide at the back post. Hibs have sold 2000 tickets from their allocation for next week's cup tie. Cuthbert rushed out 30 yards to clear from the in rushing Cummings. Cummings hits a daisy cutter from 35 yards, which never looked like troubling the goal. 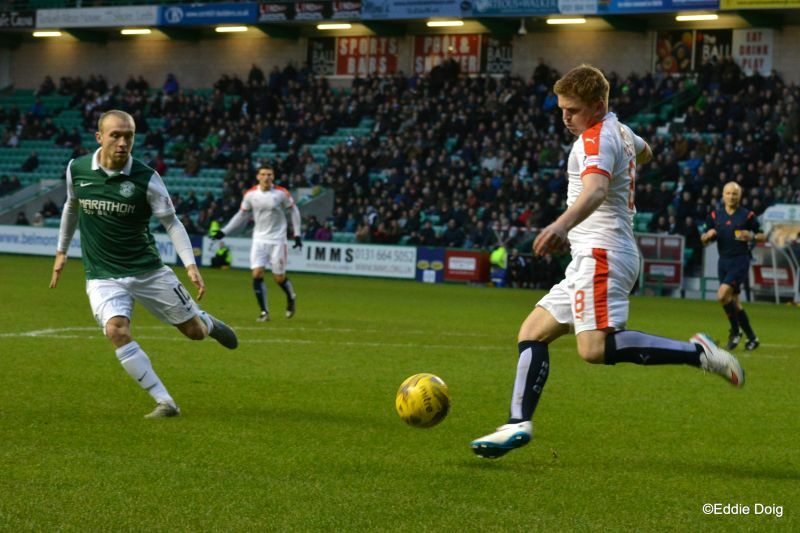 Wighton turns two defenders and released McKeowan but the ball was too quick and ran out of play. Anderson back defending heads clear. Craigen's free kick found the head of Bates who nodded the ball over the bar. Anderson yellow for a foul on Stevenson. 691 travelling Rovers fans today. Rovers pushing up, looking for the equaliser. Anier conceded a foul having Bates in a half Nelson. Anderson second yellow and red, goes off. Oxley, Gray, Henderson, Hanlon, Fontaine, Bartley, Malonga, McGeouch, Stevenson, McGinn, Cummings. Subs Reguero, Boyle, Keatings, Feruz, Anier, Forster, McGregor. Cuthbert, Callachan, Benedictus, McCord, Megginson, Matthews, Daly, Bates, McKeowan, Craigen, Robertson. Subs, Law, Petrie, Anderson, Wighton, Ellis, Ford, Mackie. 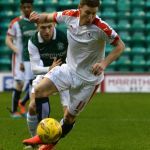 Raith Rovers will be first-footing it across the Forth this Saturday, when they travel to Easter Road to face up to Hibernian, in the first match of a league and cup double-header against Alan Stubbs side. 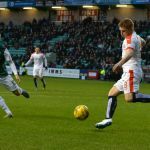 It’ll be a contest between the teams who currently reside in third and fourth position in the Championship, after Hibs slipped down a notch, after their 4-2 defeat at Ibrox was followed up the next evening by Falkirk’s win against Livingston, which lifted Peter Houston’s men to second in the table. 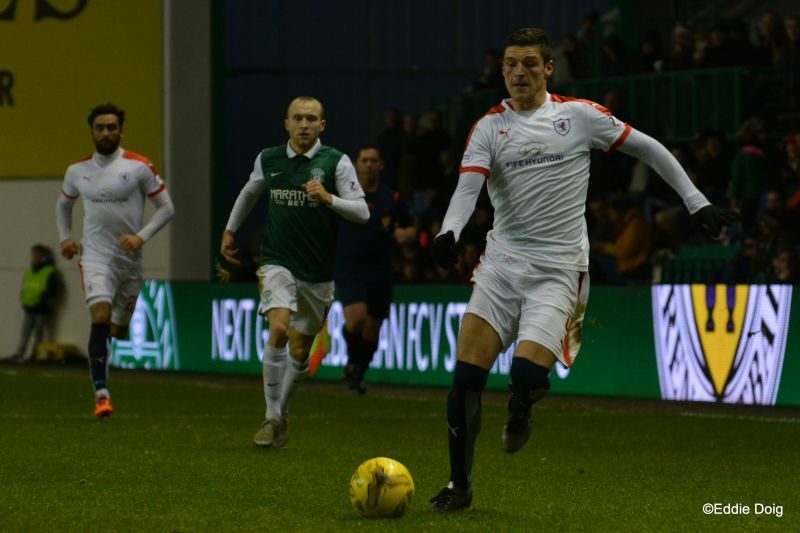 Raith have yet to register a point in two previous fixtures against the Hibees this season, although they could barely have come closer in the last meeting at Stark’s Park in October, which saw Hibs dominate the first half, and the reverse being the case in the second. 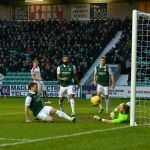 John McGinn and Jason Cummings put Hibs two up in the first period, but despite a Raith fight-back which saw Jon Daly half the arrears, and a number of close run things, Hibernian held on to win 2-1. 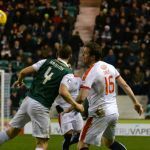 The last encounter at Easter Road also saw Hibs take a two goal lead, this time through James Keatings and Cummings again, but this time the match was of the slightly more straightforward variety, as Hibs kept Rovers at arms-length for a 2-0 win. 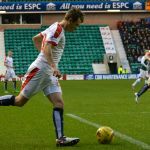 That defeat was Raith’s first loss to Hibs at Easter Road in four attempts, after the two matches there last season finished one apiece, while the Scottish Cup meeting in 2014, famously saw Rovers triumph by three goals to two. A quick look at the league table shows what Rovers are up against this weekend however. Only Rangers have picked up more points and scored more goals at home than Hibernian this season, while their miserly defence have conceded just six goals at their own venue, a figure that only Falkirk have bettered in the current campaign. In addition, Rovers last league win at Easter Road was just over 20 years ago, with a 2-1 win in the Premier League back in December 1995. As you would perhaps expect, Hibernian have by far the better head-to-head record in this fixture, with seven wins in the last ten league meetings, compared to Raith’s one. The referee for this Saturday’s match will be George Salmond.